The best walking workouts to lose weight are the ones you'll actually do. On paper, high-energy walks that include interval training and other exercises will help you lose weight the fastest. But in real life, incorporating any kind of walk into your daily routine will help you lose weight better than planning the most efficient calorie-burning routines -- if you don't find the time or motivation to do them regularly. Take a short walk every day. You don't need to drive to a running track or put on the latest model of running shoes; just wear something comfortable and walk around your neighborhood. Also, add steps to every daily activity. For example, take the steps up to the second floor at work, instead of the elevator. Park at the far end of the parking lot at the supermarket. After a few weeks of adding steps, you might be ready to kick your walking workout into higher gear. Set aside time for a focused 30-minute fitness walk every day. Do it in the morning, if possible. Author and exercise coach Jorge Cruise says exercising on an empty stomach burns more fat. Warm up by taking a few slow, deep breaths, raising your arms over your head, and stretching out your hamstrings. The Institute of Medicine suggests making it a goal to walk 5,000 steps every day. That's under 2.5 miles, and you can do it in 30 minutes once you get your pace up. Set aside about 60 minutes if you're ready to walk 10,000 steps a day. If you need motivation to carve out time for an hour of high-energy exercise every day, think about this: if you walk for an hour every day, you can burn between 300 and 500 extra calories daily. That results in about 1 lb. lost every 10 days and about 35 lbs. in a year -- without any dieting, according to "Good Housekeeping" magazine. Interval training is key here. Warm up, then walk a mile in 15 minutes. Stop to stretch your calves, hamstrings and quads for 3 minutes. Walking faster, do a second mile in 12 minutes. Take short steps, and pump your arms. Drop to the ground, and do 10 push-ups, 10 sit-ups and 10 leg lifts with each leg. Walk another fast 12-minute mile, and do another 3-minute stretch, holding and deepening the stretches. Cool down, walking a final mile in 20 minutes. For a more strenuous walk, find a location where others are doing fitness activities, such as a park or athletic field, unless you're comfortable getting sweaty and doing push-ups in your neighborhood. Buy a pedometer to keep track of steps and miles, or measure your walk beforehand with your car's odometer. If you live near a grass track or dirt road, walk there -- walking on grass or gravel burns up more calories than walking on concrete. You can also perform walking workouts on a treadmill. Treadmills allow you to select pace and incline, with uphill settings being more challenging. However, don't lean onto or hold onto the machine during your walk. 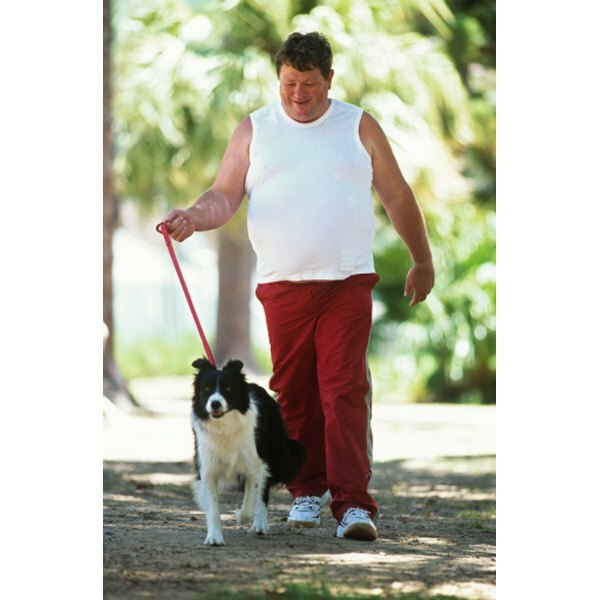 "Good Housekeeping": Lose Weight by Walking! Jennifer Poole started writing for the Bay Arts Review in Berkeley in 1977. She has worked as staff copy editor and reporter for the San Francisco Bay Guardian, the San Jose Mercury News, the Willits News and the Ukiah Daily Journal. Poole attended the University of Maine at Farmington.